Spherical roller bearings have two rows of rollers with a common sphered raceway in the outer ring and two inner ring raceways inclined at an angle to the bearing axis. Spherical roller bearings are leading in design and can, in addition to high radial loads, accommodate high axial loads acting in both directions. 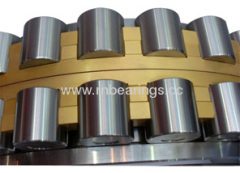 - bearings for vibratory applications. In addition to the standard range, offers a wide range of special spherical roller bearings adapted for specific applications. as described in the following. EC(J), ECC(J)--Two window-type steel cages, flangeless inner ring, guide ring centred on the inner ring and reinforced roller complement. CAF-- As CA, but with a steel cage. ECA, ECAC-- Reinforced roller complement, one-piece machined brass cage, double-pronged, retaining flanges on the inner ring, guide ring centred on the inner ring. ECAF-- As ECA, but with a steel cage. - other series have a taper of 1:12, designation suffix K.